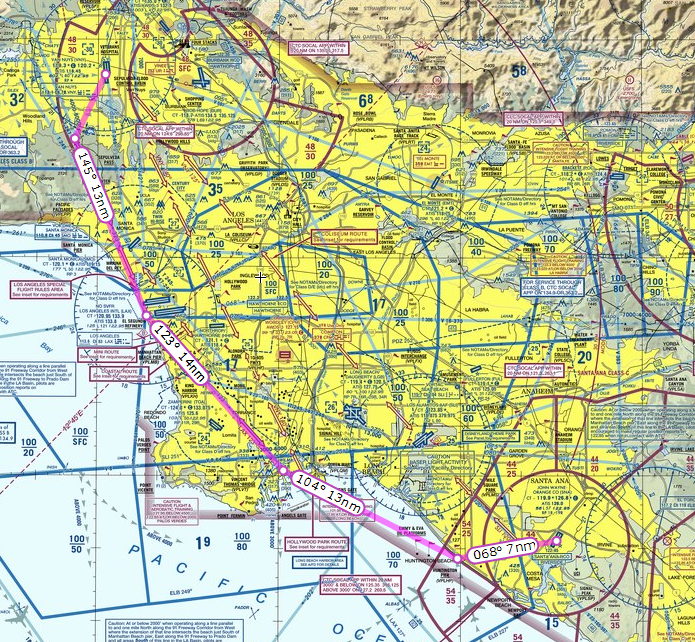 Conduct a flight from Torrance Airport (KTOA) to Van Nuys Airport (KVNY) then a second flight from Van Nuys Airport (KVNY) to Santa Ana-John Wayne Airport (KSNA) utilizing multiple transitions through the Los Angeles Class Bravo Airspace. 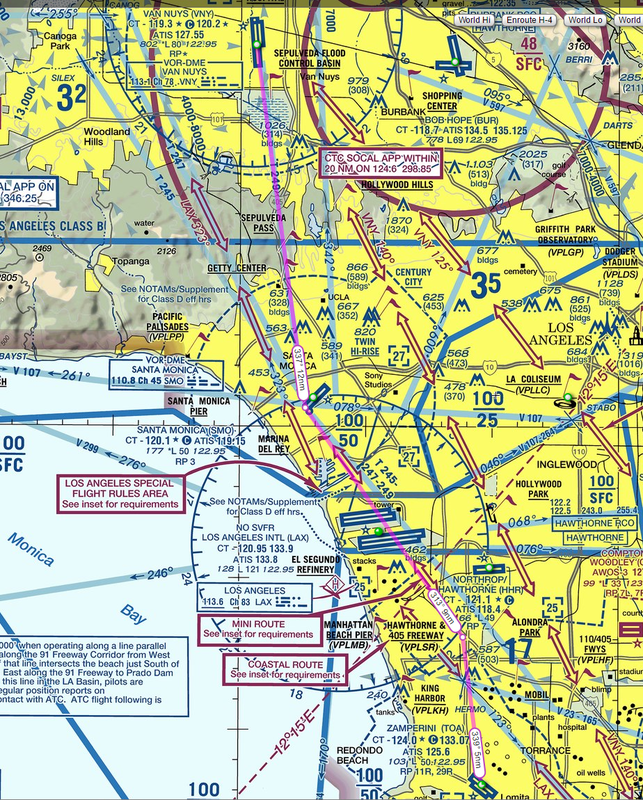 Fly from KTOA to KVNY via the Mini-Route KLAX Class B transition. Immediately after arriving at KVNY fly from KVNY to KSNA via the Coastal Route KLAX Class B Transition.. Inform ATC on initial contact at KTOA AND KVNY that you are performing the CAT-10 Rating. Use caution for the KHHR Delta when departing KTOA heading towards KLAX. Use caution for the outer shelf of the Class C airspace approaching KVNY when exiting the SMO Class D after the miniroute transition. The cruise altitude for the miniroute (2500) but in case you do decide to climb, Sepulvada Pass denotes the approximate edge of the KBUR Class C. Be sure to be below 3000 by that point to remain below the Class C unless you are now talking to Socal Approach. Class B airspace is the most restrictive airspace that VFR aircraft has access to and is located around the busiest airports in the country. Aircraft operating in Class B airspace must obtain an ATC clearance prior to entering the airspace. Additionally, all aircraft operating in Class B airspace or within 30 NM of the primary Class B airspace must have and use a mode C transponder. VFR transitions are coordinated routes through Class B airspace that allow VFR aircraft to easily transition the airspace. VFR transitions are published on VFR terminal area charts. As VFR transitions go through Class B airspace they require you to be in contact with ATC and to obtain a clearance. Note that unlike a flyway a transition consists of a very specific route to fly and altitude to maintain. 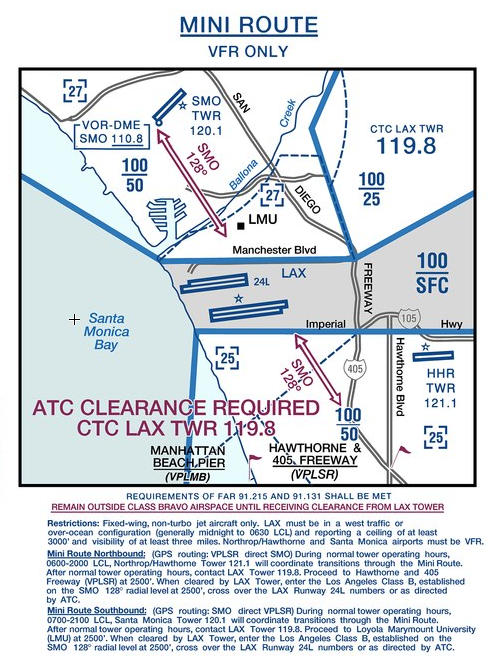 For example for the miniroute you will fly the Santa Monica 128 radial inbound to Santa Monica VOR at 2500’. Normally once established on a VFR transition you will not be able to “leave” the transition early, you will need to fly the entire transition before resuming your planned flight. The miniroute transition graphic is provided above, but you will need to reference the LAX TAC to obtain the Coastal Route chart required for KVNY-KSNA leg. While operating within Class B airspace all aircraft are provided Class B services by the local approach control. Class B services consist of traffic advisories, sequencing into the Class B airport, and separation between VFR and IFR aircraft (and certain larger VFR aircraft) operating in the airspace. All aircraft are automatically provided this service. Unlike with Class C airspace generally you cannot refuse Class B services. In order to request a VFR transition you should contact the frequency listed for the transition on the VFR terminal chart. When calling ATC state your callsign, aircraft type, location, altitude, and transition you are requesting. ATC will provide a squawk code and once radar identified provide you a clearance through the Class B airspace via the requested transition. Note that in some cases ATC will not be able to accommodate this request, in this case you must remain clear of the airspace and find an alternate way to your destination (consider a VFR flyway). Be prepared, this flight involves a large number of frequency changes in a short period of time (Torrance tower, Hawthorne Tower, LAX Tower, Santa Monica Tower in just a few minutes). Frequency changes are easy to do with real radios but can be cumbersome in a simulator. Therefore, consider pre-dialing the next expected frequency in the standby slot of the radio rather than trying to dial it in when instructed by ATC. Also, there may be some variability on this flight from KSMO to KVNY. The tower controller may hand you off to Socal, or might drop your radar services and say “frequency change approved” as you exit the Delta. The transcript below assumes the latter. Once clear of the Torrance airspace you can contact Hawthorne tower per the terminal chart in order to conduct the miniroute transition. Make sure you remain clear of the Hawthorne Class D airspace until you have established two way radio communication with Hawthorne tower. Consider requesting an early frequency change prior to leaving the airspace, or if the planets are aligned, the controller will proactively issue the early frequency change, knowing that you’re doing the miniroute. Switch to 119.8. Remember to not enter the Class B airspace as you haven’t been cleared to enter yet. ATC is required to advise you when you are exiting Bravo airspace. As it happens, the LAX Bravo has an hourglass figure and we are at the narrowest point, so the edge of the airspace arrives quickly. When clear of the Santa Monica Airspace, obtain the Van Nuys ATIS and contact Van Nuys Tower. When ready for departure to John Wayne. By this time you will be approaching John Wayne airport, so it’s a good time to get the ATIS and let approach know you will be landing at John Wayne. When Over Hunington Beach Pier. N123AB: “Over Hunington Beach Pier, Cessna 123AB.”.